Oh those crazy Hollywood scientists. They always mean well. They want to save the world, to end world hunger, to improve the human condition, imagining a future where everyone is healthy and well-fed. To do this, of course, their research requires that they create tremendous tarantulas, grown to massive size with a radioactive nutrient formula. It's only logical, right? Professor Deemer (Leo G. Carroll) is the mad scientist of Jack Arnold's sci-fi classic Tarantula. Deemer's a well-meaning soul, with a real vision for the future. But the problem of his escaped giant tarantula, which menaces a small desert community, sort of overshadows his plans for ending world hunger. It hurts his Nobel Prize chances, too, I'd imagine. Deemer's research suffers its setback when two of his colleagues, impatient with the slow progress of their work, decide to overlook the side effects of their nutrient and inject themselves with the formula as the first human test subjects. One of these men goes dramatically stumbling through the desert in the film's stark, powerful pre-credits sequence — a deformed and twisted man, his body contorted and bulging out as though subjected to tremendous internal pressures, staggering as the vast white sand of the desert and the big open expanse of the sky stretch off for miles all around him. Not long after, Deemer's other colleague, driven mad by the injection, assaults Deemer, injects him as well, and destroys their lab before dying. In the commotion, the spider, then "only" the size of a small dog, makes its creeping, crawling getaway. Although this opening sets up the tarantula's triumphant return, the bulk of the film keeps the focus off of the titular arachnid. Instead, the story turns to the local doctor, Matt Hastings (John Agar), who is investigating the death of Deemer's colleague along with local sheriff Andrews (Nestor Paiva). Hastings is suspicious about what's going on out at the professor's lab, and when Deemer gets a pretty research assistant with the un-feminine nickname of Steve (Mara Corday), Hastings takes a renewed interest in the professor's mysterious research. Throughout all this, the tarantula is lurking in the background, just off-screen, a conceit that grows more and more comical and ridiculous the bigger the spider gets. I suppose it's possible that a giant tarantula could hide in the desert for a while, but once it gets to be the size where it dwarfs a large mansion, it's hard to figure out exactly why nobody ever sees the thing. At one point, it actually hides behind a big rock formation, playfully sticking up one of its hairy legs so we know it's there, even as the protagonists manage to miss it. One wonders what would happen if someone looked at the mountain from the other side: would they see the spider ducking down there, playing hide and seek? Or would it scurry quickly around to the other side of the rock pile? At times, Arnold seems to be getting a kick out of this game of hide the spider as well, and there's something amusing about the way the tarantula's appearances become ever more outrageous as the film goes on. The thing is apparently skulking around in the night, killing cattle, picking them to their bare bones with its venom and powerful jaws. But no one sees it as it prowls the flat, open land, except a few unfortunate victims who get devoured as well. Perhaps the funniest moment is when Hastings and Andrews come across a car that was turned upside down off the road, with a pile of bones from the two passengers strewn around at the scene. "So do you think it was an accident?" Hastings deadpans, and the funny thing is that they seem to consider it a possibility. Through optical printing, Arnold gets fairly realistic effects from the juxtaposition of a real spider, greatly enlarged, onto various landscapes. The spider's distinctive scrambling, eight-legged walk is eerie at such a scale, as it lumbers over the top of a hill or creeps up next to a country house. Arnold's style is blunt and efficient, and he interweaves the tarantula's increasing destructiveness with the story of Hastings and Deemer, as the former slowly uncovers the truth behind the latter's reclusive experiments. The pace is slow and deliberate, with much time given over to the development of a relationship between Hastings and Steve — not that either progresses beyond the level of the typical B-movie cardboard cutouts, but their relationship nevertheless has a cheery and natural camaraderie that lends some heft to the human element in this story of science gone awry. Arnold also inserts some appealingly low-key character humor in the form of the hotel manager Josh (Hank Patterson), who noses his way into the town's business any chance he gets, listening in on Hastings' calls and asking prying questions of everyone he meets. His counterpart is the reporter Burch (Ross Elliott), another comic figure who does much the same things as Josh, except in a more official capacity. These touches of character humor — along with the rapport between Agar and Paiva's grizzled sheriff — help invest the film with some life and emotion, raising the stakes as the tarantula slowly grows and becomes more active, more deadly, its rampage developing mostly off-screen, waiting patiently for its eventual final showdown. The film is sometimes crude in its effects, particularly during the conclusion, when the tarantula is often transparent, as though already a ghost, anticipating its imminent demise. But on the whole the film is a raw, compelling piece of science-gone-mad sci-fi, as tough and direct as its central monster. Jack Arnold's Monster on the Campus is a weird, unintentionally goofy bit of horror/sci-fi camp, saddled with one of the most inane, scientifically implausible, outright ludicrous plots in a genre not exactly renowned for its level-headedness or scientific acuity. College professor Donald Blake (Arthur Franz) is a scientist fascinated with the study of the primeval roots of things, with those creatures who have resisted the progress of evolution. So he acquires for his university the remains of a coelacanth, the prehistoric fish originally believed to be long extinct until living specimens were unexpectedly discovered in 1938. What he doesn't realize is that this fish had been treated with gamma rays during shipment — of course! — and so contact with the fish's corpse has the unfortunate and unlikely effect of reverting other creatures back to a primitive state. The fish's blood transforms a tranquil, friendly dog into a vicious wolf-like creature, attacking everyone he sees. When a dragonfly alights on the fish and bites it, it returns as a two-foot-long insect, buzzing with a sound like an airplane. Most notably, the fish regresses Blake himself, turning him into a Neanderthal monster, a hairy ape-like creature with a murderous temper. What's interesting about the film isn't its premise, but what's left unsaid in between the lines. There's a sense in which the film isn't really about what it seems to be about on the surface — or maybe that's just what I'm hoping, since what is there on the surface is frankly pretty lousy. But there's something appealingly seedy about the way the film sets up Blake's regression as a descent into an alternative lifestyle. When he first transforms, he's in the company of the young research assistant Molly (Helen Westcott), and despite the fact that he's happily engaged to the equally pretty Madeline (Joanna Moore), his interactions with Molly are flirtatious and sexually charged. This is the beginning of his downfall, his illicit thoughts about another woman, who obviously stirs him up; she "scares" him, he says, but it's obviously more than that. Things really get bad when Blake, woozy and destabilized — by Molly or the poisoning of the coelacanth? — has her drive him home. Hours later, he wakes up in his backyard. His house has been destroyed (and his photo of his fiancée notably torn in two), his clothes are tattered, and in a grotesque, startling image, Molly is hanging by her hair from a tree in the backyard, her eyes glazed. So begins Blake's regression to the form of an inhuman monster, a transformation characterized not just by his ape-like appearance, but by the increasing strangeness and distance of his behavior in his ordinary life. He is cool with Madeline, ignoring and neglecting her, even as he draws further and further into his obsessions with the coelacanth. He's convinced that something about this fish is causing regression and creating an ape-like murderer on the campus — he just doesn't realize that he's the killer. The film is strikingly similar in its themes to Paul Landres' The Vampire from the year before, another film that used such violent regression as a metaphor for the degradation of a good man's lifestyle. Blake is just a decent guy, an eager scientist, seemingly very much in love with the perky Madeline, but his one little moment of innocent flirtation ends horribly: he takes a female student home with him and she winds up dead, hanging from a tree, while he remembers nothing. Later, Blake's increasing exposure to the coelacanth's blood plasma begins to resemble a drug addict's desire for a fix. He prepares a syringe of the stuff, injecting himself in the name of science, rationalizing his behavior as a desire to learn if the blood is really making him a killer or not. The undercurrents of sexuality and drug abuse buried within the film are undoubtedly interesting, but such threads can hardly distract from the basic clumsiness and silliness of the film. The makeup that transforms Blake into a monster is laughable, a cheap rubber monkey mask that is way funnier than it is scary. 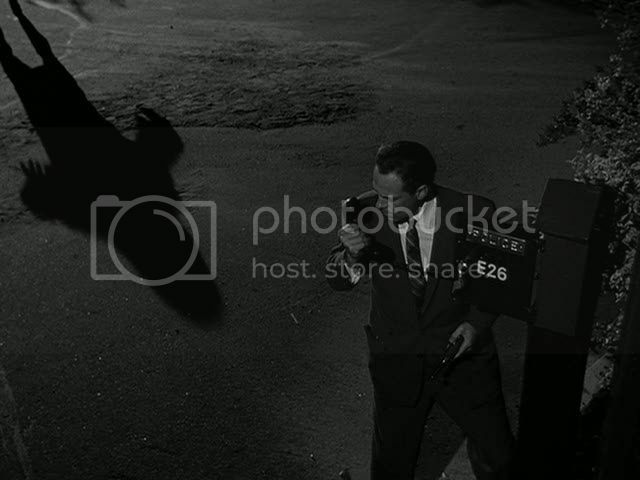 The film's one real creepy shot is, notably, one achieved entirely through shadows, a shot of the monster's shadow stretching across the pavement as it shuffles threateningly towards a man at a phone box. Whenever the monster must emerge into the light, the film's cruddy effects can't bear the weight of the horror premise. Landres' The Vampire survived a similarly silly monster with the strength of its lead performance, by John Beal, but Arnold's film has only bland, occasionally awkward acting to distract from its low-budget effects. It's a strange film, interesting for its confrontation with the darkness within ordinary men, but only fitfully translating this theme into actual compelling cinema. Mushroom clouds, the bomb and mad scientist, the 1950’s were a paranoid’s wonderland! Moreover, let’s not forget the beautiful women (Julia Adams and Marla Corday to name two). I have always had a fondness for these films (I am including the Creature films). Simple, all those now cheesy effects, yet still so effective. Part of the fun is due I believe because you get the feeling Arnold liked making them, I don’t really know, but it seems to come through in the films. I hope that you are going to include a review of “The Incredible Shrinking Man.” Great reviews Ed! Thanks, John, I agree that Arnold seems to be having fun with these films, and it really comes across. You get the feeling he's well aware of the silliness of it all, and yet he also usually treats his premises with enough seriousness that they're not simply disposable throwaways. Obviously, Incredible Shrinking Man is his masterpiece, an amazing, poignant piece of work, but I won't be revisiting that one this week: I've already reviewed that here. LOL!!! Ah, those 50's camp films that some of us grew up with and have fine memories of, regardless of their god-awful essence. Roger Corman's THE ATTACK OF THE CRAB MONSTERS must surely rate as the definitive example in the sub-genre you broach with your treatment here of TARANTULA, as its goofy humor was always embraced by the "stoners" I was in the company of in those impressionable years. While ecological disintegration, paranoia and plots to take over the world were dominant themes/motifs, the antiquated special effects stole off with much of the limelight. Both this film and MONSTER ON THE CAMPUS are as awful as a film could be, but that's entirely missing the point of course. You mentioned THE VAMPIRE too, which is a film you reviewed here months ago, as some kind of a sibling to MONSTER ON THE CAMPUS, but of course that one was infinitely batter, while still falling far short of cinematic competancy. But quality or lack thereof can never displace these cultural artifacts as entertainment that defined our early dependence of television re-runs. Few would argue with your contention that INCREDIBLE SHRINKING MAN is Arnold's masterpiece either. I will look forward to more posts on "science-gone-mad sci-fi" - a very favorite genre of mine. 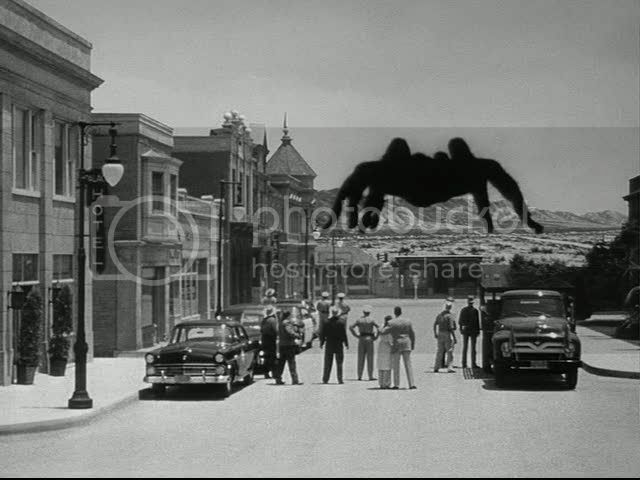 I saw Tarantula on TV a long time ago, but some of my cherished boyhood memories are seeingThe Incredible Shrinking Man and It Came From Beneath the Sea at the local movie theater. I also remember being totally freaked out by The Return of the Blob (could be The Blob Returns) - which is much scarier than The Blob - but which has disappeared into obscurity. Can't find record of it on imdb.com. Have you seen it? 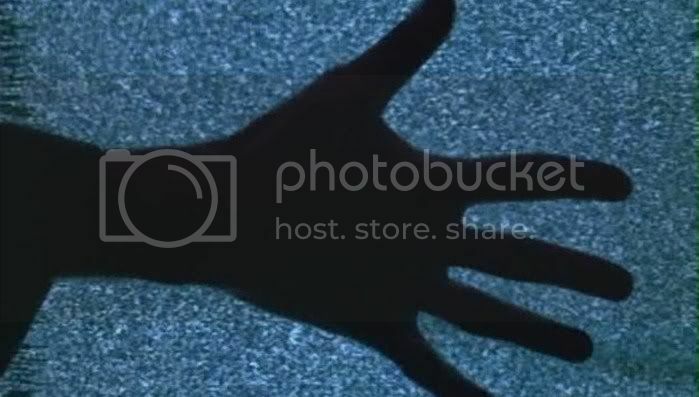 I remember it starting with a mysterious guy whose hand has been taken over by the blob; then, at the end, the blob grows enormous and takes over a huge warehouse. Thanks, Sam and Hokahey. Yeah, by most conventional measures these films are awful, especially the rather dreadful Monster on the Campus, surely a low point for the usually dependable Arnold. I agree with Sam that Paul Landres' The Vampire is a far superior film in a similar vein -- and Landres' own Return of Dracula is best of all. Hokahey, I haven't seen that Blob sequel you mention, but I remember being viscerally terrified by the original film when I was a kid. I don't think I've seen in since then, I should really revisit it. What he doesn't realize is that this fish had been treated with gamma rays during shipment — of course! — and so contact with the fish's corpse has the unfortunate and unlikely effect of reverting other creatures back to a primitive state. They never suffer the obvious: Radiation poisoning leading to nausea and diarrhea culminating in cancer that ravishes the body and finally, mercifully kills you. It is amazing to me at times that people were able to take the horrors of radiation and turn them into entertainment. I have always assumed it to be similar in nature to people in the depression wanting to see films about rich people. Somehow taking something wretched (in that case people spending desperately needed money frivolously) and turning it into entertainment, almost as a form of psycho-therapy. There's nothing else quite like 50's sci-fi. Another splendid write-up and blogathon contribution. Thanks Ed. Yeah, I don't think you're likely to see any realistic radiation poisoning in these movies, anymore than you would in comic books -- the "real" story of Spider-Man, the Hulk and the Fantastic Four would have been lengthy and painful hospital stays at the very least. It's all part of a 50s fascination/terror towards nuclear energy, and a lack of understanding about its true nature. I loved the scene in Tarantula where in order to "safely" handle nuclear material, Leo Carroll & Mara Corday put on plastic shields and handle the material with clasps from behind a small wall. Yeah, I'm sure that made them safe. And yet the same film does include some rather horrifying depictions of people whose bodies and faces are deformed by exposure to radiation. But picking that stuff apart isn't really so tough. These films, like the Japanese equivalent Godzilla, reflect a fear of the horrors that nuclear energy can unleash on the world -- even if those horrors are metaphorical rather than realistic. Yeah, there's no real radiation poisoning here, but what is the giant spider if not an incarnation of the devastation caused by radiation? I've gotta be honest - this subgenre has limited appeal for me. There are a few films that do mad science pretty well, but so many of them are so clumsy that it's hard to even enjoy the camp appeal. I get bored too easily, and believe me, I've tried to sit still. Ed, your review is more fun than these films ever would be for me. Thanks for the great writing. Thanks, Marilyn. A certain amount of boredom is pretty much part of the package with these films -- you have to expect there'll be long dull stretches, and clumsy plotting, and lousy acting. It can be a lot to look past. The best of these films (like a lot of Arnold's work) make me laugh both with them and at them. Marilyn, I agree with the boredom objection and Ed's corroboration, but I didn't feel that way when i was 8 or 9 years old watching these. It's those priceless memories that trump present-day realization. I'll admit that many of these films hold up terribly.